Today, innovative research and technology have created an explosion of agri-business opportunities. At the Agri-Technology Commercialization Centre (ATCC), we don’t just recognize that potential. We’re realizing it by transforming breakthrough ideas into commercial impact. 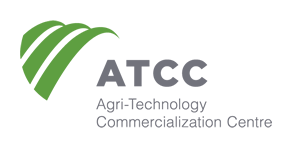 The ATCC is an internationally recognized cluster of agricultural innovation resources. Our mission is to enhance the research, development and commercialization of groundbreaking technologies and create and attract profitable businesses that advance Canada’s leadership position in global markets. By bringing together our three founding organizations — Bioenterprise Corporation, Oilseed Innovation Partners and Ontario Agri-Food Technologies — we’ve created a hub of specialized industry knowledge and market expertise. Today, that hub also includes the Livestock Research Innovation Corporation, expanding our breadth even further. Whether you want to launch a startup, scale up your operations or give your established business a competitive edge, we’ve got the tools and resources you’re looking for. At the ATCC, you can solidify business plans and take advantage of new markets with the help of Bioenterprise, get support from Oilseed Innovation Partners to maximize your growth or secure funding from Ontario Agri-Food Technologies for high-potential business trips. Since 2008, the ATCC’s cluster of organizations has helped more than 500 agri-technology entrepreneurs and businesses thrive. And with each new company established, product launched and market conquered, we’re strengthening Canada’s agriculture and agri-technology sector. The Agri-Technology Commercialization Centre is supported by Agriculture and Agri-Food Canada and the Ontario Ministry of Agriculture, Food and Rural Affairs through the Canadian Agricultural Partnership, a federal-provincial-territorial initiative.